Do you use your music to workout? To fill silence? To just jam out to? I use music to fill the silent void when the silence is about to drive you crazy. I also use it to workout all the time. I must have music for my workouts. It’s just something that I’ve come to NEED. It’s just mindless beats that help keep me going. I’ve ventured from people like The Piano Guys (classical, awesome group!) to Pitbull and FloRida (rap-ish). I love to have a variation but I also like music that will keep me upbeat and moving. (Get the moving theme here?) Besides it helps tick the minutes away as I’m working out. Nothing is worse than counting down the minutes until you’re done with a workout. It’s the same reason that if I”m running on a treadmill, I cover how far I’ve gone so I’m not playing mind games with myself and saying “Oh MMMMM GEEE, I just went .05 miles…this is going to take forever.” HAHA I think we’ve all played that game at some point. 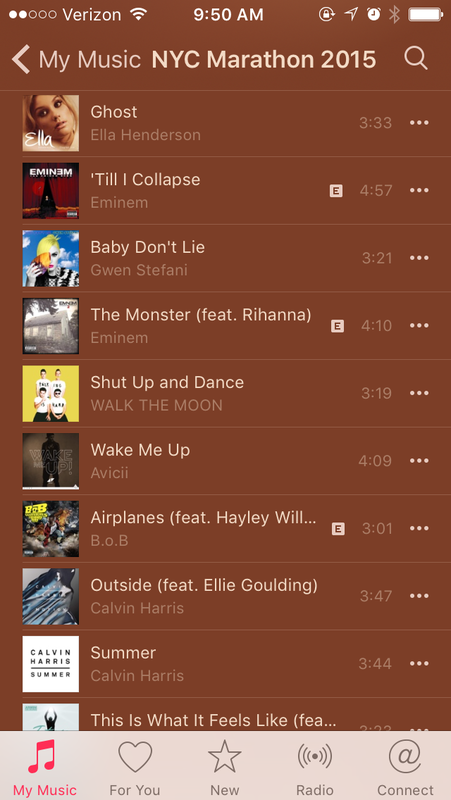 My NYC Marathon playlist that I started…and still looking for more songs! So with my upcoming marathon, I have started a playlist of music that I want to listen to while I am running for 5+ hours looking for the finish line. So far I have about 15 songs (not many for 5 hours) and in search of more. I’d love to hear what your favorite songs to work out to and add them to my playlist. Love music! These are great songs!!!!! !